e.l.f. 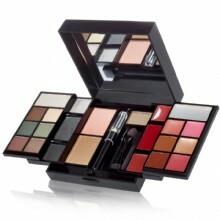 Cosmetics: FREE $10 Gift Card, FREE 27pc Makeup Set or FREE Shipping! Ok, e.l.f. is running 3 awesome promos right now! With prices starting at only $1.00, you could get a ton of stuff with your money! Check out what's included in the set...not bad for $7.95!